In a surprise announcement today, Facebook CEO Mark Zuckerberg and his wife Dr Priscilla Chan have pledged to donate 99 per cent of their Facebook fortune to their charitable trust over a period of time. 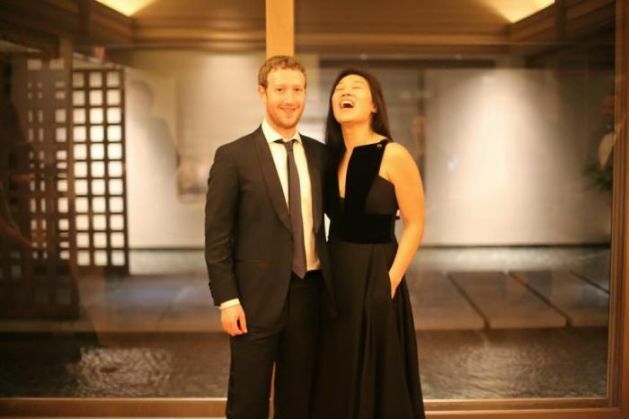 While announcing the birth of his newborn daughter Maxima Chan Zuckerberg, Mark, along with his wife, pledged to give away their shares for the cause of human advancement. As per an estimate, 99 per cent of their shares amounts to about $45 billion going by the current valuation. With this act of philanthropy, Mark's charity is one of the biggest pledges in history. The money will go to the Chan Zuckerberg Foundation, a Limited Liability Company, that Facebook says will "pursue its mission by funding non-profit organizations, making private investments and participating in policy debates, in each case with the goal of generating positive impact in areas of great need." As per an SEC filing, the full amount is pledged over the course of Zuckerberg's life. The Facebook CEO also plans to maintain his majority voting position in the company "for the foreseeable future". "In the immediate future, the Initiative will be funded by a series of three annual donations made from the sale of Zuckerberg's stock, at no more than $1 billion each year. Profits made by any of the Initiative's investment will be used for additional work to advance its goals", reports The Verge. Zuckerberg announced this initiative in a letter that he wrote to his daughter, which is focussed on two primary goals. The first goal is "pushing the boundaries on how great a human life can be," encapsulating initiatives on medicine, economic opportunity, and access to information. The second group of projects focuses more on alleviating poverty and empowering conventionally underrepresented groups. "Our society must do this not only for justice or charity, but for the greatness of human progress," reads the letter. Some of the goals that Zuckerberg defined in his announcement align to his much-controversial internet.org project, which is now dubbed as Free Basics. In the letter, Zuckerberg mentioned, "Our experience with personalized learning, internet access, and community education and health has shaped our philosophy. Our generation grew up in classrooms where we all learned the same things at the same pace regardless of our interests or needs." Free Basics aims at establishing zero-rated internet access in third-world countries. "Many of the greatest opportunities for your generation will come from giving everyone access to the internet," the letter reads. "The internet is so important that for every 10 people who gain internet access, about one person is lifted out of poverty and about one new job is created." Childhood care and education are the other priorities as mentioned in the letter. This is not the first instance that Zuckerberg and Priscilla have donated for charitable projects. In 2014, the couple pledged to donate $25 million to fight Ebola crisis and further prevention of other diseases like HIV and Polio. Recently, Zuckerberg also donated $100 million to Newark public school system towards better education. Interestingly, Zuckerberg's project bears a significant resemblance to Bill and Melinda Gates Foundation, a prominent philanthropy effort by Silicon Valley giant Bill Gates and his wife Melinda. Earlier this week, Zuckerberg partnered with Gates to fund clean energy research in the wake of Paris Climate summit. 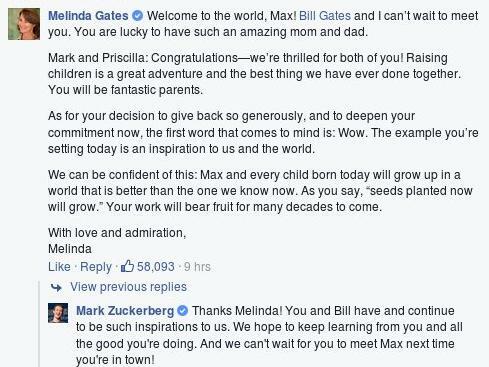 Melinda Gates has already replied to the couple's post on Facebook, saying "the example you're setting today is an inspiration to us and the world."